My Weblog: What I did instead of doing the gardening. This doll is so adorable! It must be fun to make clothes for her! Happy Friday! Hattie looks ace. & plenty of glitter and dancing = excellent. Have a good weekend! Oh, she looks so sad! I'd be mighty happy with such a fine apron! Beautiful! You are too talented. Happy dancing!! Maybe if I could borrow her lovely, lovely apron I wouldn't be so grumpy. Hattie probably just needs a good glass of wine for indeed she does look a little perturbed. You are just amazing... Love the stuff you make, you carry something truly precious within you. Thanks for making my days a little brighter with your lovely artwork! Finally, somewhere in the universe where grumpy looks sweet. I'm sure the gardening is still waiting for you. Love Hattie, even if she is grumpy. Such a nice apron she has. I don't know which I love the most - your "methods" with children or your crafts. I love you all the way. Thanks for the most inspiring, entertaining, glittering ;) site in the whole Blogistan. Hattie is lovely.Not so much grumpy as slightly camera shy and keen to get on with her baking! Thanks for sharing. So cute! It's hard to get a face with such cute personality. You did it very sweetly. Here in Australia, she'd be called Jemima, from a doll on telly in the 70s that we all grew up with. I love the embroidery on the apron! love it! twice in the same week! can't wait to see your gardening, too! oh my god that site is turn your life around material. it is gorgeous. oh loosen up thine own work (me that is) hattie is great but a tea totaller didn't you know! i hope your weekend is spiffing!!! I'm sure she just isn't keen on all the housework waiting for her and I can understand her completely. 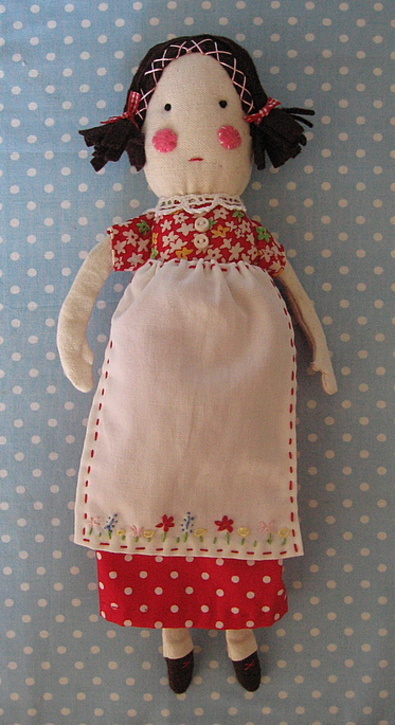 Nevertheless, she is a sweetie and I love her apron - nice work and such a funky name! Did you use felt for her hair? 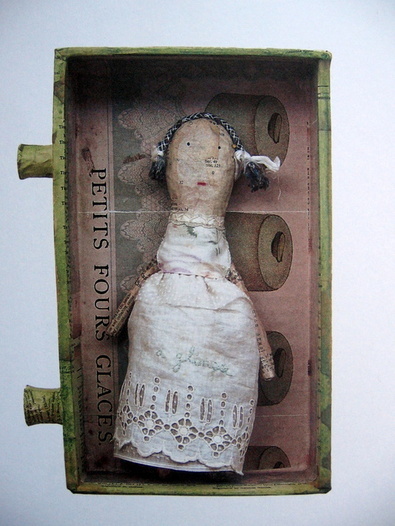 i adore julie arkell and your doll in a drawer and the doll you made through inspiration from the doll in the drawer! Cheer up Hattie - its the weekend! Thanks for the link to the wonderful French site. It takes patience but is well worth the wait. Thanks again. What a fun doll. Thanks for sharing the glimps into your creative process. Wish I could draw to put my ideas down like that. Looks like much more fun than weeding and planting. i love your creations and you make me laugh when i read your posts, i can't ask for more. Oh Hattie is lovely and I can't think why she is looking grumpy when she has such fine attire, perhaps her children refuse wine too! The next time I hear my weeds calling, I think I shall follow suit and try my hand at one of these. Simply lovely. She looks very indignant - but a bit guilty at the same time (those blushing cheeks). Wonder what she did...? lovin the doll....thanx for showing your creative process....fridays also meanwine and choccy in our house too...and saturdays!!! Oh Hattie why so glum? I would love to have been inspired by the fabulous Madeleine from Bagpuss, she takes me back to sickly days spent on the sofa watching her tell tales to the mice whilst being spoilt rotten and fed lots of hot chicken soup... ahhh, those certainly were good days indeed! I love her, grumpy or not! Utterly adorable. I loved Madeleine too as a child - but not Professor Yaffle. wonderful link to the french site, glad i speak french, so cute. and hattie---you are killing me-- so cute!!! but all your things are sooo cute!! and i love your humour, reminds me of my best drinking buddy over there in good ole england, how i miss her. thanks for such wonderful laughs! Hattie is lovely. I think she lookes pensive - maybe she is thinking about your inspiration. i hope Monday is as good as Friday! New commenter, frequent lurker. AnnaH sent me... And I've just bought and read The Crafter's Companion cover to cover after sneaking peaks of it at her cozy pad. I'm only aspiring to some day have the audacity to try something visual. Usually, I work only with words. I love the spontaneous quality of your work; it reminds me a little bit of my favorite poets. Oh my goodness I loved Bagpus when I was little, and therefore Madaline, my favourite were the mice though "Marvelous Magical Mouse Organ"!! I'm going to find an episode somewhere on the web now and watch it! I love your little sweetie!! She is so cute. Oh Hattie is just adorable, her little grumpy face reminds me of my own when things are not quite going my way, and it's too early in the day for wine, and I've already eaten all the chocolate! Thank you too for the french web link - patience was rewarded with inspirational work. and I also have to say I loved Molly's little cafe too, wish I could have dropped by for some 'soop'! I LOVE! Hattie. She is adorable, especially that face!! You scored, girl!! Hello. I've been strolling along, going from one creative, lovely blog to another... I always like to say hello and thank you when I've enjoyed a nice visit. You have a wonderful blog. Thank you. And I adore Hattie... she looks like she could use a hug. love Hattie and love your blog. I'm newly into this whole blog malarkey and I haven't seen my husband and children lately because of it! Problem is - when to find time to craft if too busy reading about other people's skills! This doll is so cute! I just got the book by Julie Arkell. She's such an amazing artist. Very inspirational. Someone who collects my Wee Creatures sent it to me recently saying it reminded him of my work. I just LOVE her!! Cute, cute, cute. Reminds me of "Jemima" from "Playschool". I love it! 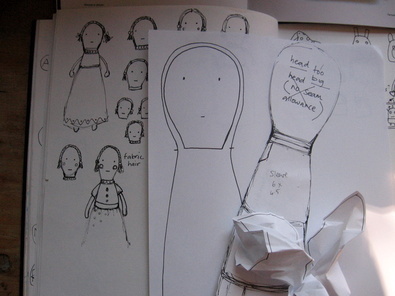 It's a very good idea and it's a very beautiful doll! trop trop joli ce que tu fais !!!! so beautiful ( correct my english write ???? ) sorry !!! !